A fake army officer terrorisng the people of Akure in Ondo state has been re-arrested. 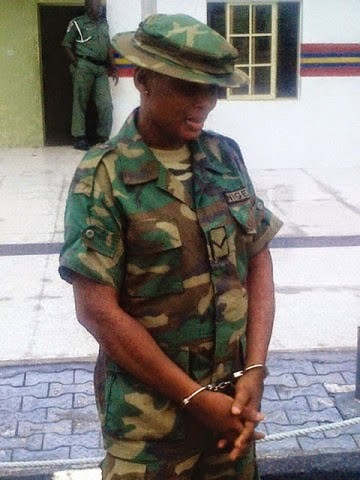 The fake female soldier identified as Tonye, was first arrested at a check-point by the military men of 323 Artillery, Akure and handed over to the police but was later granted bail. Ondo Police Commissioner Isaac Eke stated that the suspect was again arrested at military checkpoint at Igbara-Oke while in a military uniform performing security duties. Tonye said she purchased the army uniform from Delta State. She pleaded for mercy and promised never to do it again. Since she hav d urge of bcomin a soldier i advic dat nigerian soldiers shud tak her 4 trainin but dos nigerian govment do anytin for free 4 its citizen? Yes guys, since she has the zeal of becoming a soldier, forgive her and train her to be a soldier that she want to be. A begi, live am jare make she dey jolly. Abi na only her waka com?, Tell army head to give her army job emmedately. I don’t get. What is her motive nd what did she confess?